The Lathem LTN Mecanical Numbering Machine Stamp is designed to stand up to years of heavy daily usage. 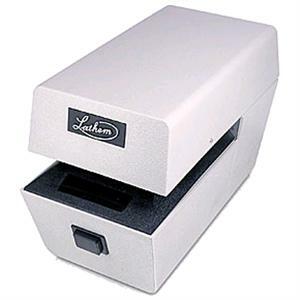 The LTN Numbering Machine Stamp provides smooth stamp registers with remarkable precision. A manual stamp button on the front of the unit allows the user to operate the stamp manually if positioning of the stamp registration is praticularly important. The LTN imprints up to six digits onto documents, checks, invoices and more. Up to 5 additional digit wheels can be added and of course also allows for the addition of upper and/or lower die palates for static text to be included with each numbedr stamp. Die plates can be purchased separately and can be included with the numbering stamp per-installed (allow extra time for deliver, whether pre-installed or not, die plates can take up to three weeks for delivery). Text (or die) plates can have up to 3 lines of text above or below the number imprint (19 characters per line including spaces).